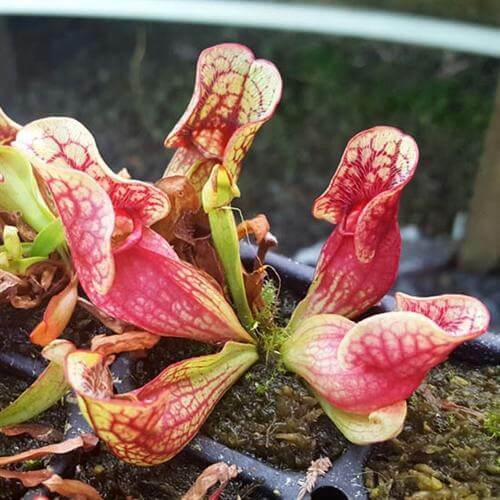 Purple pitcher plant (Sarracenia purpurea) is an evergreen, semi-erect, Carnivorous perennial Plants that grow to 30cm tall. 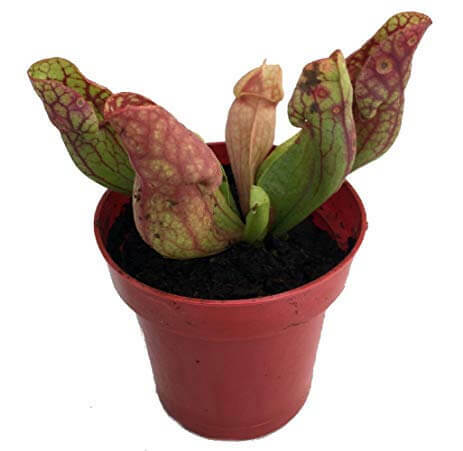 Squat, green pitchers, to around 15cm long, are flushed and veined purplish-red, have a large lip and an erect, frilled lid. Rather than being known as a lid, it is normally called the hood. This hood is generally beautifully veined with treelike patterns and is covered with stiff hairs pointing towards the pitcher opening. Five-petalled, purple blooms, up to 5cm in width, are borne well above the pitchers in spring. Common Names: Purple pitcher plant, Northern pitcher plant, Turtle socks, or Side-saddle flower. It requires bright locations with some direct sun. Sunlight will deepen the red/purple color of their leaves. It grows best in a nutrient-poor medium because the rich potting mix will harm its roots. Use a mixture of 1 part peat moss with 1 part perlite or sharp sand. It thrives well in Cool to average room temperatures 60°F – 70°F / 16°C – 21°C. It will tolerate a minimum of 40°F / 4°C in winter. Water regularly throughout the growing season, Keep soil evenly moist year-round. Use only distilled or rainwater, because this plant is sensitive to chemicals in tap water, use only distilled or rainwater. Do not allow the soil to dry out. It requires moderate to high, above 50% relative humidity. Set the plant on a humidity tray to raise the moisture around it. Do not fertilize the plant. They’re specialists at managing with nutrient-poor situations. All the nutrients they’ll need will come from their own ability to trap pray within the pitchers and you don’t need to give them anything extra. If you never get any insets in your home, then consider putting your plant outside for a few weeks or so during the Summer and they will find sufficient food during this time. It can be easily propagated by division. Divide in spring when new growth begins. Also can be grown from seed, but germination is slow.